Posted January 20, 2011 Disclaimer The information presented here is for informative and educational purposes only and is not intended as curative or prescriptive advice. The world, in 2011, is experiencing shortages of food; resulting in higher food prices. 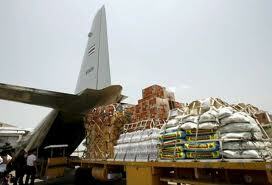 Food shortages are expected to trigger food wars, riots, starvation and food related illnesses. This threat of food shortages has spurred interest in growing food at the local level. 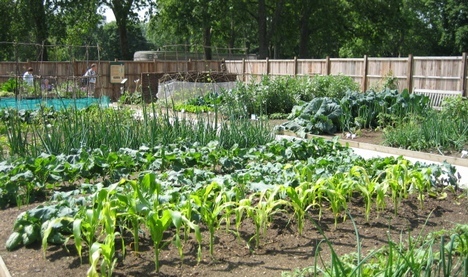 One way to deal with anticipated food shortages and expensive food is to grow food where people live. 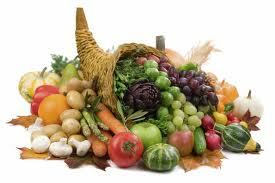 This article documents and collates information about growing food locally. Centralizing the food supply has resulted in making food available the year round in rich countries like Canada, United States and Europe. Food, like avocados from South America, apples from New Zealand, cherries, lettuce and broccoli from Chile are all flown at an increased price during the winter months. Ecoshock: growing insane However, the bad side of such a food supply system is that it has caused a great disparity in the food supply available to the poor and rich countries of the world. For example: The average disposable income spent on food, beverages, and tobacco ranges from 17% in high-income countries to 53% in low-income countries. On average, Americans spend less than 10%, while Nigerians spend 73%. Univ Michigan: Social Development The point being made here is that people in rich countries can afford to buy foods imported from outside of regional, state and even national boundaries at consistent products at low prices, while people in poor countries simply do not have money to buy expensive food from outside their countries. Consequently, people in poor countries face starvation and death while people in America face lower nutritional quality and higher food prices. This peaking of crises all at the same time triggers the need to think about surviving in a futuristic world of consumer shortages and possible chaos. One way to survive is to ensure a steady supply of food by growing food locally. There are food riots going on around the world. People are burning stores in India, Chili, China, Egypt, Tunisia and Algeria. People will put up with a lot — corruption, nepotism, cruel laws, and barbaric prisons — but they tend to lose it when they can’t afford food. This is especially true when they blame the ruling class for their misery. "But whereas in years past, it's been weather that has caused a spike in commodities prices, now it's trends on both sides of the food supply/demand equation that are driving up prices. On the demand side, the culprits are population growth, rising affluence, and the use of grain to fuel cars. On the supply side: soil erosion, aquifer depletion, the loss of cropland to nonfarm uses, the diversion of irrigation water to cities, the plateauing of crop yields in agriculturally advanced countries, and .... due to climate change — crop-withering heat waves and melting mountain glaciers and ice sheets. These climate-related trends seem destined to take a far greater toll in the future. Already, there are reasons to be concerned: food riots in Algeria, soaring wheat prices in the United Kingdom, an 18 percent inflation rate on food prices in India, and the Mexican government trying desperately to fend off rising corn prices in order to prevent a recurrence of the so-called "tortilla riots" of 2007, among others. Last week, the United Nations Food and Agricultural Organization reported that food prices hit an all-time high in December—higher than even the spike between 2007 and 2008, a rise that caused a global food crisis. There are many reasons for the spike, and unfortunately, two of the major ones aren't getting better any time soon. The first is population: We gain 219,000 fellow humans every year. Sometime in late 2011, we will number 7 billion as a global population. (See our population special for more.) The rate of population growth has slowed, but we're pretty much guaranteed to keep expanding. The second reason is equally intractable: Many of the current environmental factors driving constraints on food resources, including heat waves, drought, and severe weather, are only going to get worse as the climate changes. This is on top of the water resource depletion and soil erosion that were already underway. And unlike previous rises in food prices, there is probably no turning back from this one. "We can no longer expect that things will soon return to normal, because in a world with a rapidly changing climate system there is no norm to return to." Our food system is particularly energy-intensive and vulnerable to fluctuations in energy prices. These energy prices are not included in the real cost of food. Speculation on Wall Street: Another overlooked aspect of the cost of food is Wall Street speculation on the food supply. Speculators are gambling on the future cost of food, thereby indirectly also causing a food shortage in the world. Hidden costs: But the biggest affect on cost of food is the hidden and covered up cost of food production and distribution. According to Lester Brown, our market-based economy is not telling the truth about the real costs of fossil fuels supporting the growth of food. "Our market-based global economy as currently managed is in trouble. The market does many things well. It allocates resources with an efficiency that no central planner could even imagine, much less achieve. But as the world economy expanded some 20-fold over the last century it has revealed a flaw— a flaw so serious that if it is not corrected it will spell the end of civilization as we know it. The market, which sets prices, is not telling us the truth. It is omitting indirect costs that in some cases now dwarf direct costs. Consider gasoline. Pumping oil, refining it into gasoline, and delivering the gas to U.S. service stations may cost, say, $3 per gallon. The indirect costs, including climate change, treatment of respiratory illnesses, oil spills, and the U.S. military presence in the Middle East to ensure access to the oil, total $12 per gallon. Similar calculations can be done for coal. We delude ourselves with our accounting system. Leaving such huge costs off the books is a formula for bankruptcy. Environmental trends are the lead indicators telling us what lies ahead for the economy and ultimately for society itself. Falling water tables today signal rising food prices tomorrow. Shrinking polar ice sheets are a prelude to falling coastal real estate values. 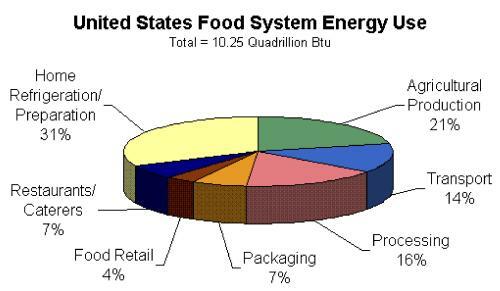 Hidden energy use within the food system. The graph below projects the cost of energy used to provide food. Source: Heller and Keoleian. Life Cycle-Based Sustainability Indicators for Assessment of the U.S. Food System. 2000. The energy consumed in a system is often a useful indicator of its sustainability. Modern agriculture and the food system as a whole have developed a strong dependence on fossil energy. We generate much of our electricity for refrigeration from fossil fuels. In many ways oil powers the world. It powers our transportation systems and our commodity distribution systems. If the price of oil goes up, the price of EVERYTHING, including food, goes up. A realistic way to fight the impact of fossil fuels on the cost of food is to grow food locally; thereby lowering the transportation and refrigeration costs. It has been shown that local food systems do reduce food miles, which in turn tend to reduce energy consumption; but there are exceptions. But ... it also depends on the kind of local transportation used. Air freight emits more greenhouse gases per food mile than any other mode of transport. 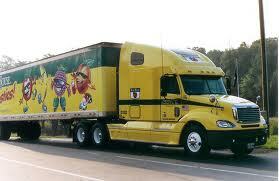 Big trucks are second in emitting greenhouse gases and emit more pollution than smaller trucks. 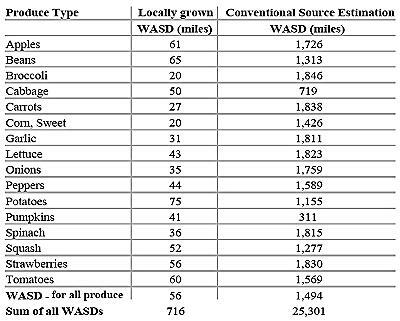 The table below compares the distance cost of locally grown foods to imported foods. What is localized agriculture? A new trend in the global food supply is decentralizing how we grow food and how we plan cities. Cities are planting surrounding streets and open landscapes "green;" thereby making cities more habitable and sustainable. UCLA: Sustainability Growing food locally [ localized agriculture ] has many advantages over food grown "air miles away" in a distant country. Local food reduces the number of "food miles" between farm and plate, and helps to keep agricultural profits in the local economy. This means that farms and farmers grow their food locally and also sell their produce and food in the areas in which food is grown within their region. Localizing agriculture helps local economies improve by keeping the money local, buying local produce from farmers in your area and creating jobs locally. Localizing cuts down on the transportation, refrigeration and storage costs of shipping food around the country. Many schools and universities are now making a point of buying local food because it is fresher, tastier, more nutrient-rich and it fits into new campus greening programs. Supermarkets are increasingly contracting seasonally with local farmers when produce is available. For example, in late 2010 Walmart announced a plan to buy more produce from local farmers for its stores. Some year-round food markets are evolving a supply of only locally produced foods, including not only fresh produce but also meat, milk, cheese, eggs, and other farm products. Home gardening [ back yard ] was given a big boost in the spring of 2009 when First Lady Michelle Obama worked with children from a local school to dig up a piece of the White House lawn to start a vegetable garden. There was a precedent for this: Eleanor Roosevelt planted a White House victory garden during World War II. Her initiative encouraged millions of victory gardens, which eventually grew 40 percent of the nation’s fresh produce. School gardens are another welcome development. Children learn how food is produced, a skill often lacking in urban settings, and they may get their first taste of fresh salad greens or vine-ripened tomatoes. School gardens also provide fresh produce for school lunches. California, a leader in this area, has 6,000 school gardens. Illustration on right is an example of an innovative urban garden on the roof top of a school in Manhattan, NY. Illustration on left is a school garden in a Chicago school. 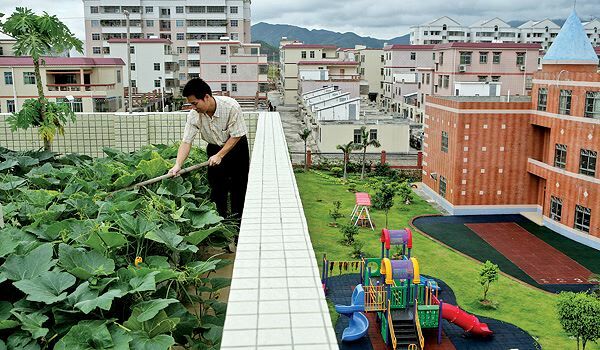 Roof Top Gardens: High rise buildings the world over are building roof top gardens as a way to grow food locally and to also provide energy savings. 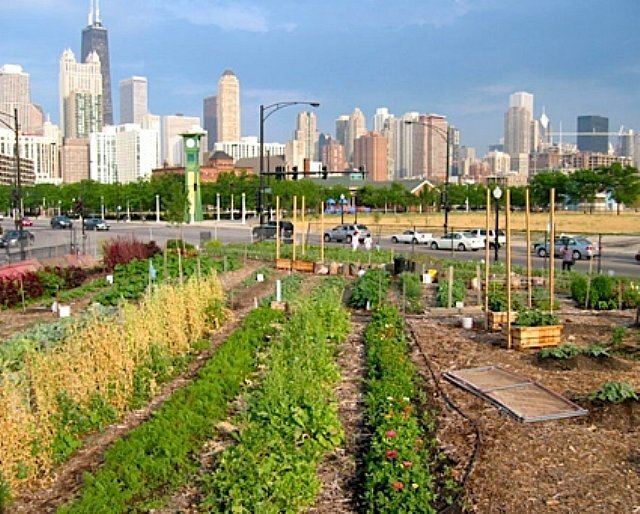 Urban gardens are gaining popularity throughout the world. 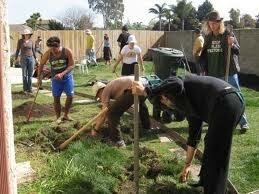 The whole idea is to plant food, trees and shrubs to help a city feed itself, and food gardens especially for the poor. "The American way of eating has become the elephant in the room in the debate over health care. President Obama has made a few notable allusions to it, and, by planting her vegetable garden on the South Lawn, Michelle Obama has tried to focus our attention on it. President Obama talked about putting a farmers’ market in front of the White House, and building new distribution networks to connect local farmers to public schools so that student lunches might offer more fresh produce and fewer Tater Tots. He’s even floated the idea of taxing soda. But so far, food system reform has not figured in the national conversation about health care reform. And so the government is poised to go on encouraging America’s fast-food diet with its farm policies even as it takes on added responsibilities for covering the medical costs of that diet. To put it more bluntly, the government is putting itself in the uncomfortable position of subsidizing both the costs of treating Type 2 diabetes and the consumption of high-fructose corn syrup. Table 1. 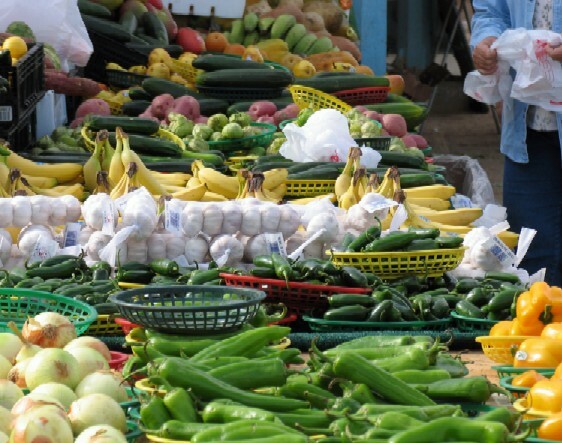 What individuals can do to reduce food miles. Adapted from Brian Halweil's Home Grown: the Case for Local Food in a Global Market. 2002. 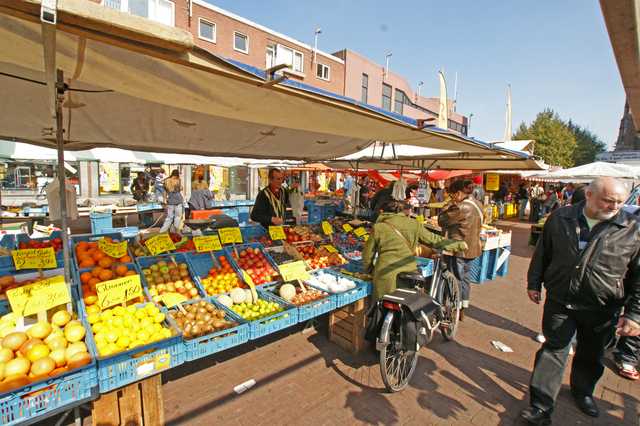 Shop at a local farmers' market. People living in areas without a farmers' market might try to start one themselves, linking up with interested neighbors and friends and contacting nearby farmers and agricultural officials for help. People can do the same with CSA subscription schemes. Eat minimally processed, packaged and marketed food. Generally speaking, the less processing and packaging you see, the less energy went into production and marketing, the less global warming pollution was created. Consolidate trips when grocery shopping. Consider carpooling, public transportation, or a bike trailer for hauling groceries to reduce your personal contribution to food miles. Limit the amount of meat you consume and when you do buy meat, look for organic or free-range meat produced on sustainable farms. Produce a local food directory that lists all the local food sources in your area, including CSA arrangements, farmers' markets, food co–ops, restaurants emphasizing seasonal cuisine and local produce, and farmers willing to sell direct to consumers year-round. Speak to your local politician about forming a local food policy council to help guide decisions that affect the local food shed. The current food system is unsustainable. It is dysfunctional. There is a somewhat silent world food growing-distribution revolution taking place. 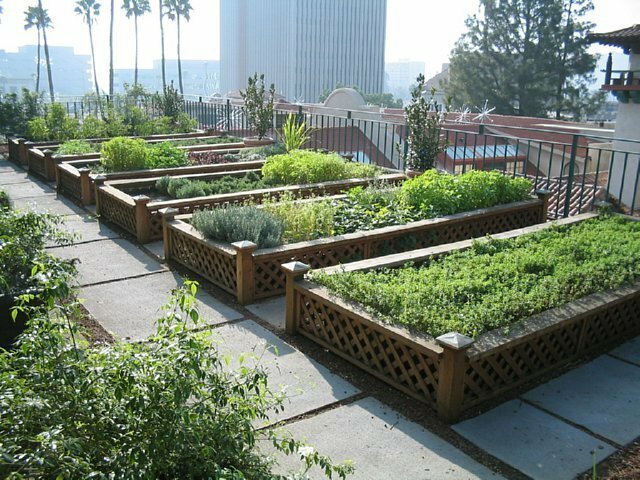 Although many places in the world are making their roof tops green, they are not really growing a lot of food locally on the roof tops. More show than go! Most roof tops were not built to support a heavy green roof. From the review of information herein and from a common sense point of view , growing food locally and minimizing transportation and storage expenses [ getting rid of fossil fuels as dependent sources of energy ] is the best way to fix an unsustainable food system. There can be no real health care reform without a reform of agricultural subsidies, of the food system and of the life styles of people. Politicians need to wake up to the reality that growing food locally is a lot better than importing it from distant regions! Grow your own food, cook in home and eat at home! Doing so helps you to control your own destiny! Sustainability is accepting the idea that surviving in a troubled and shrinking world is more important than making money! Brown Lester R., "Adapted from Chapter 9, “Feeding Eight Billion People Well,” in Plan B 4.0: Mobilizing to Save Civilization," Earg Policy Institute, December 01, 2009. Brown: localizating agriculture Lester R. Brown is founder and president of Earth Policy Institute in Washington, D.C. The term 'food miles' refers to the distance food travels from the location where it is grown to the location where it is consumed, or in other words, the distance food travels from farm to plate. Recent studies have shown that this distance has been steadily increasing over the last fifty years. Studies estimate that processed food in the United States travels over 1,300 miles, and fresh produce travels over 1,500 miles, before being consumed. Leahy Stephen, "In Corrupt Global Food System, Farmland Is the New Gold," IPS [Internet Press Service], UXBRIDGE, Canada, January 13, 2011. Credit:UN Photo/Albert Gonzalez Farran Leahy: Farmland Is the New Gold "More than 100 billion dollars has been invested in buying farmland since 2008, mainly in Africa by foreign companies and state entities." 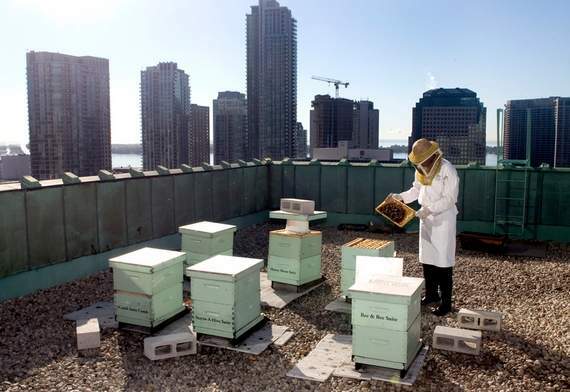 Mohn Tanya, "Hotels are ‘going local’ with rooftop gardens, beekeeping," New York Times, October 19. 2010. 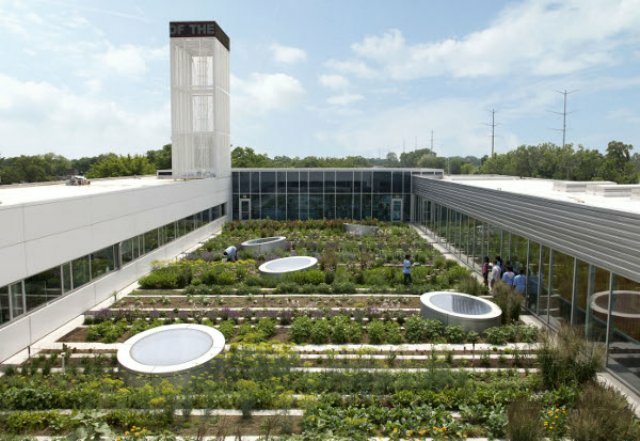 Mohn: Hotel roof gardens Hotels are going local, establishing partnerships with area farmers and growing food in rooftop gardens. They are catering to travelers seeking to eat healthily on the road. The municipal government of Belo Horizonte, Brazil’s fourth-largest metropolitan area with over 3 million inhabitants, is ensuring the human right to food while promoting localization. Fueled by the belief that food security is a public good on par with education and health, Belo Horizonte established a department to ensure access to food. Using roughly 1% of the municipal budget, this department collaborates with community groups, NGOs, and private retailers to fund and coordinate an astonishing array of cost-effective programs that reach every sector of the population. Many ideas being implemented in Belo Horizonte are also advancing in the Bay Area, including local farm-to-institution marketing programs, urban gardens, farmers markets, and local low-cost food programs in underserved neighborhoods (like the People’s Grocery Mobile Market in Oakland). Belo Horizonte has also pioneered innovative programs such as a city-run cafeteria serving thousands of healthy meals to the public each day (usually for under $1.00), and an urban orchard program that plants fruit trees in low-income neighborhoods for all to harvest. A vital lesson from Belo Horizonte is that city governments can effectively use their power to fund, coordinate, and implement food security programs. ii In the Bay Area, many nonprofits and community groups still struggle for acceptance of some of these ideas, leaving many untapped opportunities for the public sector to demonstrate support for their oft-stated goal of food security for all. i Quoted in Frances Moore and Anna Lappe. Hope’s Edge (New York: Putnam Press, 2000). ii Cecilia Rocha, An Integrated Program for Urban Food Security: The Case of Belo Horizonte, Brazil (Toronto, Ontario: Department of Economics, Ryerson Polytechnic University, 2000).